This Earth Day, we are hearing a lot about how businesses can help the environment by adopting Green initiatives. There are lots of different ways – reduce energy consumption, manage waste, employ alternative energy resources, etc. Another way that businesses can “Go Green” is by purchasing used or refurbished equipment and having broken equipment repaired rather than replacing it with new gear. At Black Box Resale Services, we take pride in the fact that we we save a phone or networking switch’s life by keeping it out of the landfill and giving it a second go. 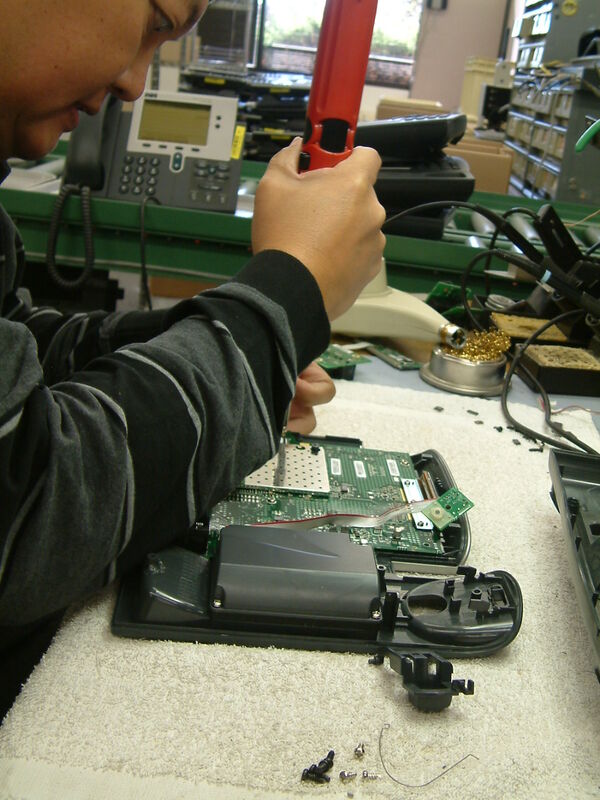 We repair a lot of phones and other gear. They come into our facility broken down and dirty, and when we are done with them they look and function good as new. Our repair specialists are certified experts in their field, and work with the latest technologies as well as older legacy equipment. Our repair services include testing, cleaning, sanitizing, plastic recoating, silk-screening and painting – to certified specifications as good or better than OEM specs. Black Box Resale Services also purchases old or unwanted equipment from companies that want to “clean house” and make back some of the money they invested in it. We’re kind of like an animal shelter – telecom shelter – and don’t worry, we will make sure to find a good home for your equipment! The bottom line is that by taking advantage of refurbished equipment you can save money and still enjoy the same quality and warranty as new. Repairing your broken gear instead of tossing it out and getting new gear also saves you money without loss of performance. Saving money is a great incentive, and on top of that you can take stock in the fact that you are doing the environment a favor. 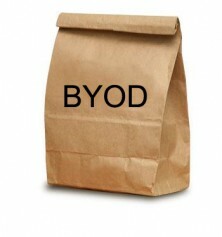 BYOD(Bring Your Own Device) is a concept that will quickly become a reality for many educational institutions. The concept is simple – instead of a school supplying desktop pcs or netbooks to all of their students, the students will instead bring their own device to the classroom. At first it may seem that this is just a way to cut costs for the school, which is one nice side effect as funding for education continues to feel the squeeze. However, this is not the main goal of this conversion. It is about flexible, mobile and personalized learning practices. While a full switch to complete BYOD might be a plan for the future, beefing up a campus’s wireless capabilities today can let students utilize their devices and blend with the network topology that already exists. In this post, I’m specifically talking about post-secondary education. The implications and implementation concerns are quite different for K-12, yet it is still already being adopted there and ropes being learned along the way. The difference with higher education is that the vast majority of students already have a capable device. They have laptops, netbooks, iPads, Blackberrys or Android devices and all of these can become networked devices capable of being a valuable learning tool. Wouldn’t it be great if students could access course materials wherever they were on campus wirelessly through their own device? Instructors could send class announcements immediately with a few clicks. Students sick in bed could still take exams, review notes or even watch a live webcast of a lecture. On top of this, university resources could be accessed on mobile devices and e-books used instead of textbooks. There will always be a need for desktop pcs and wired networks for specific learning situations such as resource-intensive applications and lab environments. Network infrastructure already in place simply needs a refresh or upgrade to accomodate wireless connectivity and security for devices that students use. The needs include greater bandwidth, a number of wireless access points and controllers across campus, reliable switching and enhanced network security measures. It may sound daunting to begin this path toward campus-wide wireless connectivity and eventual BYOD. Fear not, because here at Black Box Resale Services we have provided full solutions for our partners in education. From cost-saving refurbished equipment to cabling and deployment of robust wireless networks, we can get a campus up to speed in no time. When we do network rfreshes and upgrades for educational facilities, we reccommend Cisco Certified Refurbished Equipment. Cisco wireless access points, Cisco Wireless Bridges and Cisco Routers and Switches. These high-quality and affordable refurbished components offer unmatched performance and reliability. Contact your sales representative at Black Box Resale Services to learn more about upgrading your current ststem to get your campus up to speed with wireless connectivity. 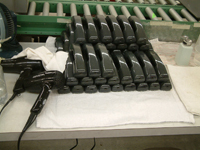 When a box of phones enters our warehouse, they are inspected by our team and a series of quality checks is done. This determines exactly what needs to be done to get each phone looking and operating like new. They are then put into inventory based on these quality checks. 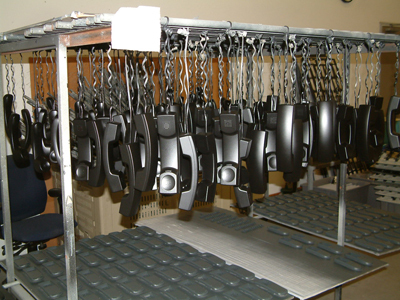 After the phones are disassembled, they go through a 3 stage wash and cleaning process. 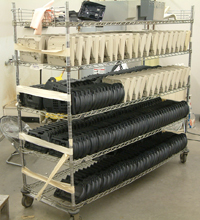 After an alcohol wipe to get them ready to paint, they are put in racks and dried overnight. This rigorous cleaning process ensures that once painted the phones will look just as good as phones that come from the factory new. We take pride in our products, and it shows. 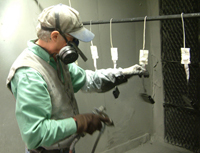 Our specialized paint room sets us apart in the telephony refurbishment game, and we move a lot of inventory each week as the paint center now operates full-time to keep up with demand. 60 different colors of paint give us the ability to offer customers a range of options to fit their needs. After the paint dries, the finishing touches are put on the phone – including new logos. Black Box Resale Services utilizes a silk-screening process for the logos, which is unique as well. Many refurbishers simply slap on a sticker or decal, but the silk-screened logo makes the phone look factory-fresh. So there it is, a photo essay about the lifecycle of a painted phone. We give old, broken dirty phones a serious makeover and keep usable equipment out of the landfill. Purchasing refurbished equipment saves you money – you already know that. Buying refurbished also shows that your company is a “Green” business because usable equipment is kept out of landfills – investors and customers like a Green company – but you already knew that too. Warranties for refurbished products are on par with and often actually exceed warranties for new products – you already knew that too, right? There is one more benefit to purchasing refurbished equipment that many people do not know about, and that is higher initial reliability. When you purchase something brand new, you expect it to perform to its utmost functionality right out of the box, correct? Unfortunately, this is not the case with many of the things that we buy. A new car, or any type of engine for that matter, needs to be “broken in” by not pushing it to its limits during a specified time period when bought new. On the other hand, new networking and telecommunications equipment should be stressed to optimum operating conditions and beyond before being fully deployed into a system. Studies and tests show that 90% of equipment failure happens within the first 200 hours of use. This is referred to as Infant Mortality Failure. Manufacturers have different testing procedures in which new equipment is stressed and tested under optimal operating conditions. These stress tests are called Equipment Burn-in. While these tests do ensure that equipment will operate, they surely do not run new equipment for 200 hours (necessary burn-in period) before shipping it to the end-user. Because of this, many new products still incur Infant Mortality Failure soon after the equipment is deployed into the system. While warranties may sometimes cover the replacement of these broken components, they certainly do not cover the headaches, lost time and potentially lost data and productivity that results. Refurbished equipment has already gone through the required 200 hour burn-in period and performed to specs in a real network. Infant Mortality Failure is no longer a worry. On top of this, at Black Box Resale Services we again run equipment through rigorous real-world tests to ensure that we can stand behind it as what we refer to as better than new. Our repair and testing facility is state of the art and allows us to plug components into a real network environment so that you can rest assured knowing that your refurbished system will run smoothly right out of the box. In fact, at Black Box Resale Services we are so confident in our refurbished equipment’s reliability that we can offer warranties that often exceed a manufacturer’s warranty for new equipment. We offer a five-year warranty on most of our refurbished phones and phone repair services. Your phones are tested, repaired, cleaned, sanitized, and painted – to certified specifications as good or better than OEM specs. After a final test, your phones are repackaged with a new literature pack, coil cord, base cord, and handset. Best of all, they are guaranteed for 5 years! We offer a two-year warranty on most of our other refurbished products and repair services; manufacturers usually offer just a one-year warranty. This includes networking gear such as servers, bridges and switches. You can feel secure with our guarantee because we test, retest, and certify our products to ensure top-quality performance and presentation. More reliable than new. Another strong reason to consider purchasing refurbished networking and telecommunications gear from Black Box Resale Services. Contact a Black Box sales representative today to begin planning your refurbished solution. Cisco has recently advanced its efforts to convey the risks of purchasing the company’s equipment from non-certified sellers and resellers. This is a problem which continues to plague all aspects of the Business and Technology world, and as a Gold-Certified Cisco partner Black Box Resale Services wants to ensure that consumers are informed about the issue. All organizations, from the pizza shack at the end of the block to the United States Department of Defense need to know that their network’s equipment is genuine. If it is not, and if concessions are made to purchase grey market or non-certified gear, the results can be disastrous. Any short-term cost savings will not be worth the damage bad equipment will do to your company’s infrastructure. Since 2005, the FBI has cracked down on counterfeit Cisco equipment through its “Operation Network Raider” initiative. Main focus for this operation is on Cisco products coming from China. It is feared that counterfeit Chinese networking products find their way into US markets via non-certified and grey market sellers and resellers, and the Government’s network security may be put at risk. It is a distinct possibility that network engineers may be installing counterfeit Cisco devices into networks containing sensitive data, and unwittingly aiding other countries as they attempt to spy on us. Equipment may be rigged with back-door access, viruses or malicious software designed to fail. Also, much of this equipment is simply not up to the quality standards of Certified Cisco Equipment. If a company installs counterfeit networking gear, chances of network failure are greatly increased – not to mention the imminent danger of a system failing in a nuclear facility or air traffic control center. In 2010, the FBI stated it had seized $145 million worth of counterfeit Cisco equipment in a covert operation that’s netted no less than 715 seizures and brought 31 felony convictions. 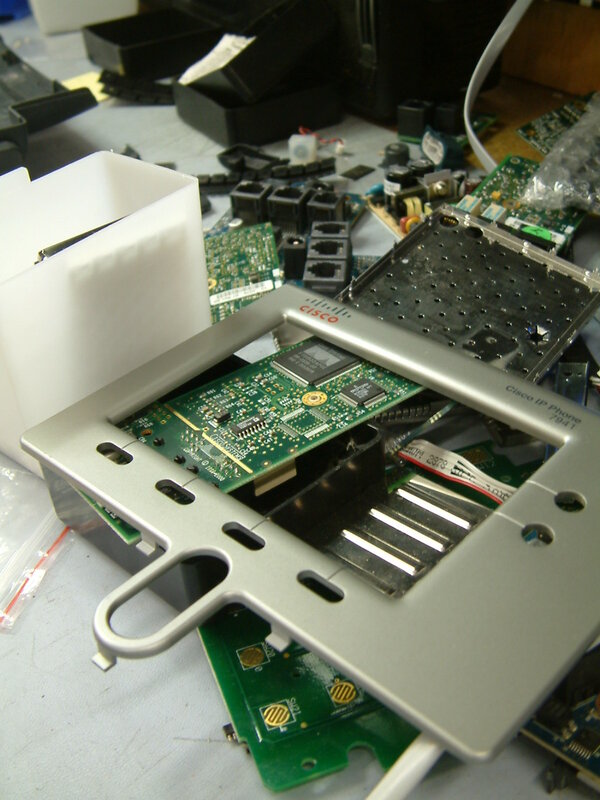 What is Cisco Certified Refurbished Equipment? These documents from Cisco certainly establish the many benefits to purchasing Certified networking and telephony equipment. Any business can rest assured knowing that their equipment is of the highest quality, backed by Cisco warranties, and exhaustively tested to ensure that it operates to utmost functionality. The peace of mind that comes from buying Certified Cisco is one of our highest commodities here at Black Box Resale Services, and we have worked hard to produce that peace of mind through the high standards we are held to in order to be called a Gold-Certified Cisco partner.